Johann Thomas Kaiser was born in Michelau. According to the Wolferborn parish records, Johann Michael Kaiser, son of Johann Kaiser of Michelau, and Elisabetha Schneider, daughter of Johann Melchior Schneider of Michelau, were married on March 12, 1711. Among their children was Johann Thomas, who was baptized on August 19, 1725. Johann Thomas Kaiser baptism record. Source: Wolferborn parish register. In 1766, Thomas Kaiser decided to accept the offer described in Catherine's Manifesto and migrate to Russia. 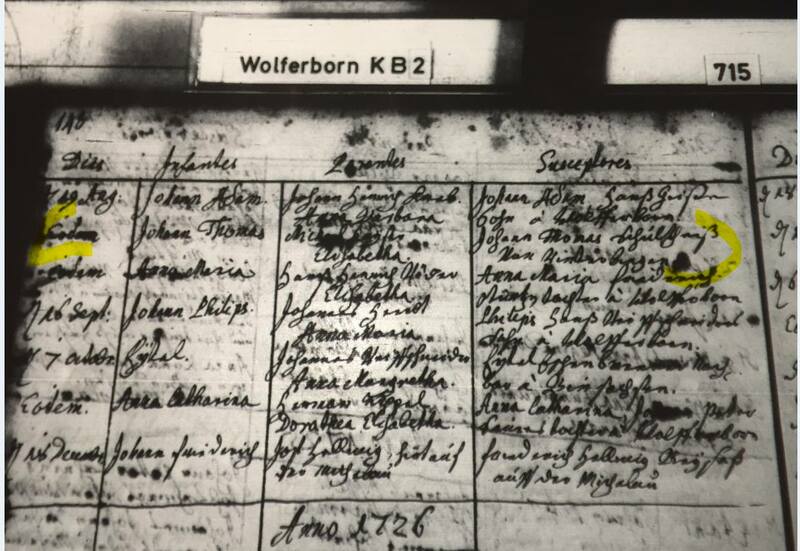 There is no marriage record for Thomas in the Wolfersborn parish records, so it is likely that he initially departed for Russia as a single man. Thomas sailed from Lübeck with other colonists who arrived in Oranienbaum, Russia on August 29, 1766 aboard the ship “Apollo”. Thomas declared that he was from the county of Isenburg. At this time, the ship list shows that he is married to Anna. Also aboard this ship and listed adjacent to Thomas and Anna is a Johann Kaiser who is also from Isenburg. Johann is traveling with his wife Elisabeth and their servants: Ernst and Magdalena (both 20 years old). It is currently unknown how and if Thomas and Johann are related. Thomas is recorded in the 1767 Norka Census with his wife Christina (age 20) living in Household 108 with her sister, Anna Maria (age 12). Household 107 lists a Just Kaiser and his wife Magdalena. Just maybe the Johann Kaiser who arrived with Thomas in 1766. Magdalena may be the person who was listed as "servant" in the ship arrival records (her age is consistent). It is not known how Just is related to Thomas. ​All of the people in these two Kaiser households arrived in Norka on August 15, 1767. Hein, Maggie. Research in German parish records for Wolferborn, Dec. 2017.